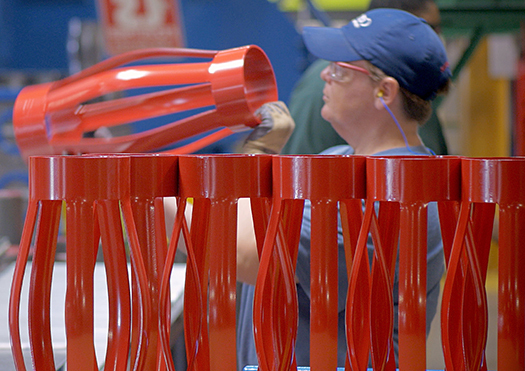 A sister company to Centek Limited in Great Britain, Oklahoma City’s Centek Inc. was established in 2012 to help distribute the manufacturer’s uniquely-designed centralizers. The company was built with excellence in mind. Understanding that achieving and maintaining excellence is an ongoing journey, it built its operations with Lean Manufacturing as a core tenant. With Centek’s forward-thinking attitude and willingness to adapt, it reached out to manufacturing extension agent Kevin Barber. Barber is one of 17 MEAs working throughout the state to grow industry. He is sponsored locally by Francis Tuttle Technology Center. “We started getting together and figuring out what I could do to help,” says Barber. “One of the things we worked real closely on is the Enterprise Excellence Group. Actually in 2008, John helped me to launch the Enterprise Excellence Group. He was my founding president for that organization. Barber connected HR manager Nadine Key with Francis Tuttle, which helped identify and train individuals to promote Centek’s corporate culture of continuous improvement. Carnuccio takes a look at those future leaders and is optimistic about the manufacturing industry. “Everywhere you go, everything you do is with things that are manufactured, and taking raw material and adding value and converting it into things we can use to make our lives better,” says Carnuccio. “It is critical to our success globally,” Barber adds. With the mantra, “Excellence to the core,” Oklahoma City’s Centek is doing its part to ensure that vision becomes a reality. Centek has developed an innovative design for a casing centralizer used in the oil and gas industry.